My Kind of Town… Food, Wine and a Discount. Do you have plans this weekend? 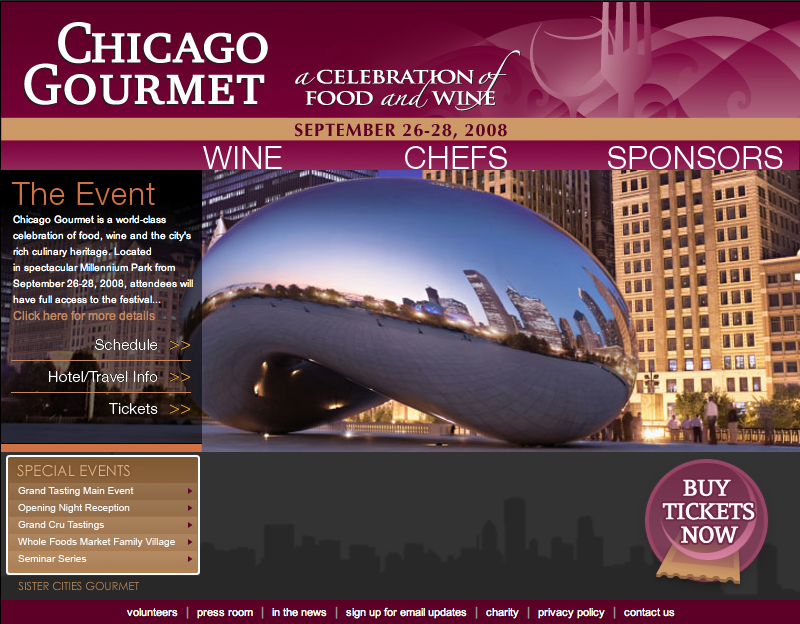 You might want to consider attending Chicago Gourmet. “The only urban gourmet food and wine showcase with tastings, demonstrations and hands-on workshops in the U.S. that is open to the public, launches its premiere event on September 26-28 in Millennium Park. And since you all are the most sought after tastemakers on the web, Easy and Elegant Life has been offered a special online promotion of 10% off your ticket to the event. Use the promotional code: CG2008TEN when registering. Can you imagine what your next dinner party will look like after you’ve been steeped for two days in the best that the culinary world has to offer? Send me your tasting notes! This entry was posted in Entertaining, Living and tagged Chicago. Food, events, wine. Bookmark the permalink. 3 Responses to My Kind of Town… Food, Wine and a Discount. I was there this time two years ago and it’s the perfect time to be there. Chicago’s a great place! I do love Chicago – this would make it even better!